Attended the consultative forum on the draft Customs Administrative Order (CAO) on Dispute Settlement and Protest. The CAO prescribes the policies, guidelines and procedures dispute settlement and protest in the BOC. The scope of the CAO shall cover the right to administrative and judicial remedies of an aggrieved importer or exporter by a decision of the BOC pertaining to dispute settlement or protest arising from customs valuation, rules of origin, tariff classification under certain circumstances, and other customs issues. Objectives of the CAO are the following: a) To provide fair and expeditious resolution of dispute settlement and protest arising from customs valuation, rules of origin, tariff classification under certain circumstances, and other customs issues, b) To help ensure uniformity and consistency in the application of customs policies, rules and regulations on dispute settlement protest, c) To align the administrative and judicial remedies provided by law with the standards set out in the Revised Kyoto Convention (RKC), the World Trade Organization’s (WTO) Agreement on Trade Facilitation, and other international trade facilitation agreements, and international best customs practices. With regards to the submission of position paper on the CAO, SPIK leaves the matter to FPI. The Industry Stakeholders Consultation was presided by Ms. Maria Corazon Dichosa-Halili, Executive Director, of BOI. Representatives of Nine (9) of the twelve (12) Priority Industries in Regions IV-A, RIII and NCR which includes the Chemical Industry were invited. The consultation is the coming into fruition of the Signing of the Memorandum Agreement for the DTI-DPWH Convergence Program between DTI Secretary Ramon Lopez and DPWH Secretary Mark Villar during the Manufacturing Summit 2016 last November 29, 2016 at the Makati Shangri-la. Director Constante Llanes, DPWH Central Office Planning Service presented the draft of the DTI- DPWH Convergence/Roads Leveraging Linkages of Industry and Trade (ROLL IT) Program which is patterned after the success of the DOT-DPWH Convergence Program, or the Tourism Road Infrastructure Program (TRIP). The Objective of the ROLL IT Program is: Facilitate the efficient and more coordinated among the two Departments to identify, prioritize, and implement road access infrastructure leading to various industries and economic zones in a technically-correct and politically-participative process. SPIK is pleased to announce the Board of Directors and Officers 2017- January 23, 2017. Congratulations and we wish you success in the exercise of your mandate to ensure the sustainability and importance of SPIK in 2017 and in the years to come as Chemical Industry implements the Roadmap. 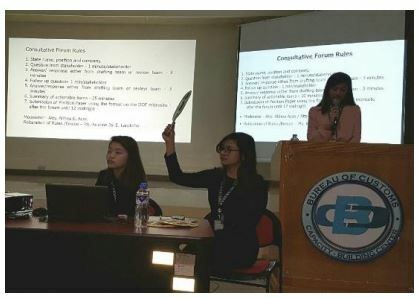 The Food and Drugs Administration (FDA) and the Center for Cosmetics Regulation and Research (CCRR) conducted a public consultation on the Revised Rules and Regulations on the Licensing of Establishments Engaged in the Manufacture and/or Distribution; Registration or Other Authorization; and Labelling of Household/Urban Hazardous Substances at the Calamba City Hall. This is a nationwide activity of the agency simultaneously done in other regions. 1st Technical Working Group (TWG) Meeting for the Chemicals Cluster for 2017. SPIK President Mr. Dennis Tirthdas co-chaired the 1st Technical Working Group for the Chemical Cluster last January 31, 2017 in BOI Penthouse. Where they discuss the issues in ease of doing business matters, improve trade and investment promotion activities, address environment issues and work on human resource development, product development and innovation.